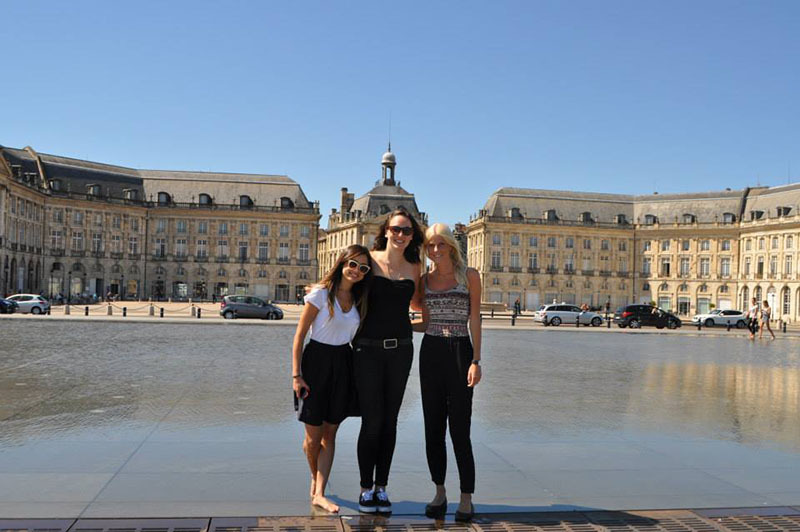 Learn French in Bordeaux at our partner French language school in Bordeaux, France Langue-BLS. Our partner school is housed in a beautiful and spacious 19th century building right in the heart of the city. The intensive course offers 20, 26 or 30 hours of French lessons per week. The intensive 30 course requires basic knowledge of the French language in order to participate. The intensive 26 and 30 courses are available for beginners. 20 Lessons: Monday through Friday from 9:30 till 11:00 and then, after a 15-minute break, from 11:15 till 12:45. 26 Lessons: All the intensive 20 classes and 6 extra classes after lunch from 14:00 till 15:30 on Monday and from 13:45 till 15:15 and, after another 15-minute break, from 15:30 till 17:00 on Tuesday. 30 Lessons: All the intensive 20 classes and 10 extra classes after lunch. From 14:00 till 15:30 on Monday, Thursday and Friday and from 13:45 till 15:15 and, after a 15-minute break, from 15:30 till 17:00 on Tuesday. *Class times may be subject to change and will be confirmed when you book your course. Minimum age is 17 years . The intensive course of 30 lessons is not available for beginners, minimum level is elementary (A2). A double room is only available for students travelling together. A surcharge applies if you want to stay in a host family in the centre or in a host family with private bathroom (executive host family). Price on request. The daily tax of € 1,50 per person per night is not included and will have to be paid directly to the residence. The minimum age for staying in a studio is 18 years old. The summer residence is available in from 02/06/2019 to 31/08/2019. The minimum age for staying in the summer residence is 18 years old. The transfer price is per person and for one way when arriving on the train station of Bordeaux Saint Jean. When arriving on the airport Bordeaux Merignac it costs € 60,- per person for one way. The costs for the course material are not included in the price and has to be paid on site. The price depends on the language level you have, and therefore the course book you will be working with. In 2019 the school is closed on: 01/01/2019, 22/04/2019, 01/05/2019, 08/05/2019, 30/05/2019, 10/06/2019, 15/08/2019, 01/11/2019, 11/11/2019, 21/12/2019 - 05/01/2020. The combined course is specially designed for those participants who would like to study in a group, yet at the same time have some private lessons for their professional or personal needs. 20 group lessons + 6 individual lessons per week. Minimum combined course duration is 1 week. During the private lessons you can choose to focus on specific subjects as business French, French for tourism or medicine etc..
During this program you will follow 20 French lessons in a group with a maximum of 12 students. The minimum duration is 12 weeks. This course is meant for students that would like to have a total immersion in the French language and culture and need the language for professional purposes such as study or work. The commercial French course is recommended for students who use French mainly in business situations. In addition to the intensive course, the afternoon commercial French lessons cover the language skills needed in the work place such as negotiating, telephoning, presentations, writing reports, etc. It consists of 20 group lessons + 6 individual lessons per week. Minimum duration is 1 week. This course is not available for beginners, minimum level is elementary (A2). This course, designed for non-native French teachers, offers you the opportunity to explore the subtleties of modern French, to develop your teaching skills and to focus on class dynamics while deepening your knowledge of French culture and civilisation! The teacher course is aimed at either current or future teachers of French as a foreign language. In order to take the teacher course, you must have at least an advanced level of French. At the end of the course you will get a certificate of attendance and a final report. Minimum age is 21 years . If you would like a taste of the famous French cuisine while you learn French, then this is the perfect course for you! This course consists of 20 lessons Intensive French per week and will take you on 4 gastronomic outings per week where you will both experience and learn to recreate French cuisine. The intensive French lessons take place in the morning Monday through Friday, whereas the culinary outings take place in the afternoon on Tuesday through Friday. This course is a great way to improve your French and to learn how to impress everyone (including yourself) with your novel gastronomic skills! This Bordeaux French and wine course has been designed for wine lovers and gourmets, for both professionals and amateurs, seeking to combine a French learning experience with the pleasures of tasting some of the most outstanding wines of France. The French and wine course includes 20 lessons of French lessons per week,two wine workshops per week and 3 excursions to visit castles in the wine country. Minimum age is 18 years . French & Wine includes 20 French lessons and 5 activities related to Wine, such as wine tasting, excursions (for example to "châteaux") and lectures. The DELF/DALF course consists of 20 lessons of General French in combination with 3 modules per week (each module = 2 lessons) which are focussed on DELF/DALF exam preparation. This course has a duration of 4 or 6 weeks, and has specifing starting dates throughout the year (see below). The DELF course has a duration of 4 weeks. The exam costs vary per level from € 80,- to € 180,- Please contact us for the exact exam dates and prices. If you want to do the DELF/DALF exam after your course, you might need an extra night or week of accommodation. The one-to-one course is perfect for those who want to optimise their study time. The aim of the one-to-one course is to offer a fully personalised method of teaching designed to meet your specific needs and desires. As the classes are private, you will be able to decide the schedule and content. 15 or 20 lessons per week. During your language course in Bordeaux you will live with a real French family. You will stay in a single room with bed and breakfast, half board or full board. During the summer months June, July and August, all students in the age between 16-19 years always stay in a twin room in a host family with half board or full board. The summer residence consists of several single studios of approximately 18-25 m2. The studios are all furnished and equipped with a kitchenette, dishwasher, dining area, bathroom, toilet, wardrobe, telephone and access internet. The price includes a daily tax, use of water, internet and electricity. The travel distance from the residence to the school is approximately 25 minutes by bus (line 4) and approximately 15 minutes to the center of Bordeaux. The summer residence is available for students from 18 years old. The residence is built in the renovated wine warehouses of the Galerie Tatry and has comfortable and modern apartments and studios. It is located near the Palais des Congrès, the building is a 10-minute walk from the town centre and the quayside and 10 minutes by tram from France Langue BLS. Advantages: equipped kitchen area, private bathroom (with bath and WC), air-conditioned, WiFi access at reception/free cable Internet access in rooms and free parking..